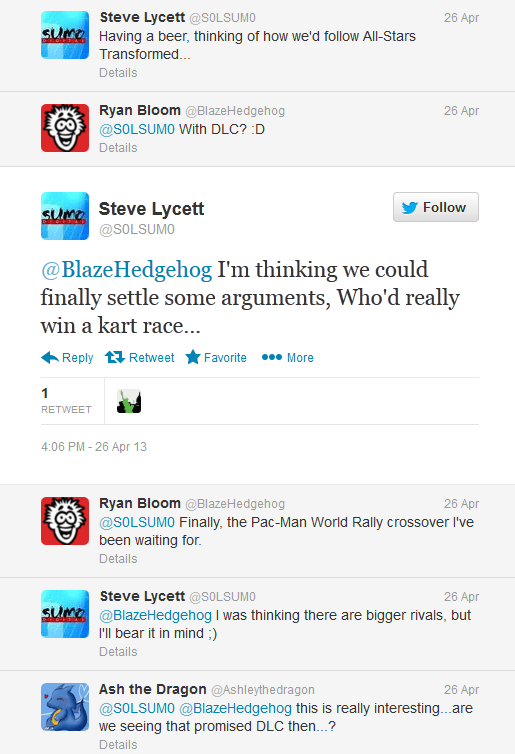 Rumor: Could Sumo Digital be teasing Sonic VS Mario Kart? Over on twitter, some of the developers from Sumo Digital seem to be talking about how they will follow up Sonic Racing Transformed. Take a look below:? I honestly think it would be wonderful if Sonic were to appear in Mario Kart. But I think Mario Kart should go the way of Smash Brothers and let other characters be in it. Mario Kart is starting to get a bit stale in my opinion, even if Mario Kart 7 is a really great game. I seriously can’t wait for E3, some megatons are coming our way for sure.